CannonDesign expands a leading provider of technology-enabled transportation and supply chain management services to create a “one-company culture”. CannonDesign shares more via its video walkthrough, below. 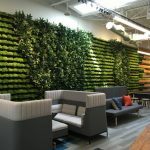 Echo Global Logistics, a leading provider of technology-enabled transportation and supply chain management services called on CannonDesign to expand their workplace and create a “one-company culture”. From this, they were able to create an open plan workspace with different workspace types adding a buzz to the entire community. When was the project completed? This project was a 135,000 SF expansion. It adds to 90,000 SF of existing space. Was this new or renovated space?
. “ECHO” is sculpted as four massive letters in weathered steel. The letters are set at different angles to create a shifting experience for passersby. What is the average daily population? The majority of Echo’s office is open plan. The blocks of bench seating are organized around two main streets that cut the length of the workplace. These streets are generously wide and lit at a lower level of illumination than the task-based desk area to give them a sense of calm amidst the buzz of the workplace. What kind of meeting spaces are provided? Two client-facing conference rooms are glass boxes placed in the middle of the open workplace, showcasing the dynamic environment. The staff has access to quiet rooms designed to evoke truck loading docks—to give them a place of quiet away from their desks. More casual team breakout spaces are located along the two main streets, with pull-out furniture and digital resources. The office space also has an all-hands meeting space with 16 60” monitors that form a singular massive screen or break down to smaller groups or singular viewing sections. This enables team members to view company updates, track weather and receive news. The blocks of bench seating are organized around two main streets that cut the length of the workplace. What other kinds of support space or amenity spaces are provided? The Echo Global Logistics space also offers employees a café serving breakfast and lunch, complemented by a coffee bar with a full-time barista, and a state-of-the-art training facility. Has the project achieved any special certifications? The project has received multiple design awards including a Divine Detail Special Recognition award from the American Institute of Architects Chicago Chapter and a RED Award from the International Interior Design Association, along with an Award of Merit from the Illuminating Engineering Society. The biggest challenge was creating a dynamic workplace for the great numbers of employees that needed to be accommodated within the facility. What are the projects location and proximity to public transportation and/or other amenities? The location is in close proximity to major bus and commuter train lines. Was the “C” Suite involved in the project planning and design process? If so, how? The company’s Chief Financial Officer was the C Suite’s representative and was actively involved in the project from kick-off through to completion. What kind of programming or visioning activities were used? We conducted a visioning session that included members of the C Suite and other key champions of the project from the organization. Both our design and workplace strategy team authored the content and participated in the session to develop a complete understanding of Echo’s goals with the project. Design elements allude to the transportation industry, such as the focus rooms that look like loading dock doors and four graphic-feature walls that borrow their mojo from custom big-rigs. Were any pre-planning surveys conducted to get employee input? Yes, a survey was conducted to measure a baseline of employee thoughts on the existing workplaces, including quality of the workplace, ability to be effective and how culture is supported. In addition to the survey, we also did observations of the existing workplace over a one-week period. We also held focus groups with staff to have a more candid discussion than possible in the survey format. Please describe any program requirements that were unique or required any special research or design requirements. The biggest challenge was creating a dynamic workplace for the great numbers of employees that needed to be accommodated within the facility. Further challenging the situation, the location is within a building originally built as a catalog warehouse, which required a larger-than-typical number of structural columns. The organization grew out of the two main streets. Bringing that number of people into space also required that the restroom count be greatly increased. Four restroom blocks were built within the space, with each given a treatment evocative of trailers tricked out with graphics that might be found on a custom rig. What kind of branding elements were incorporated into the design? The formula for an echo is “Velocity=Distance/Time.” This equation is the DNA of transportation logistics at Echo Global Logistics and the essence of its 132,000 SF headquarters expansion. The Echo brand is apparent as soon as one enters the space. “ECHO” is sculpted as four massive letters in weathered steel. The letters are set at different angles to create a shifting experience for passersby. Upon entry, the E is perfectly aligned and luminous, while the O appears darker and more abstract. As the individual moves, each letter comes into similar focus as the others change shape, altering perception with distance and time. 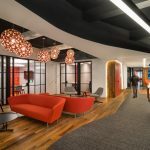 Design elements allude to the transportation industry, such as the focus rooms that look like loading dock doors and four graphic-feature walls that borrow their mojo from custom big-rigs. What is the most unique feature of the new space? Most important to us in thinking about the design wasn’t a single feature but creating a balance. Work with play, clamor with calm, reflection with discovery. Employees here can have very intense workdays responding to client needs, and we wanted the workplace to give them that needed balance. Work with play, clamor with calm, reflection with discovery. How did the company communicate about the changes and moves? The company handled the change management process. Two client-facing conference rooms are glass boxes placed in the middle of the open workplace, showcasing the dynamic environment.